When Friedrich Nietzsche made angel food cake, did the angel survive the encounter? When Sigmund Freud handled raw fish, where did his thoughts take him? Exactly what did Dorothy Parker mean by the term “Parker House Rolls?” And how did Ernest Hemingway handle his favorite bullfight souvenirs? 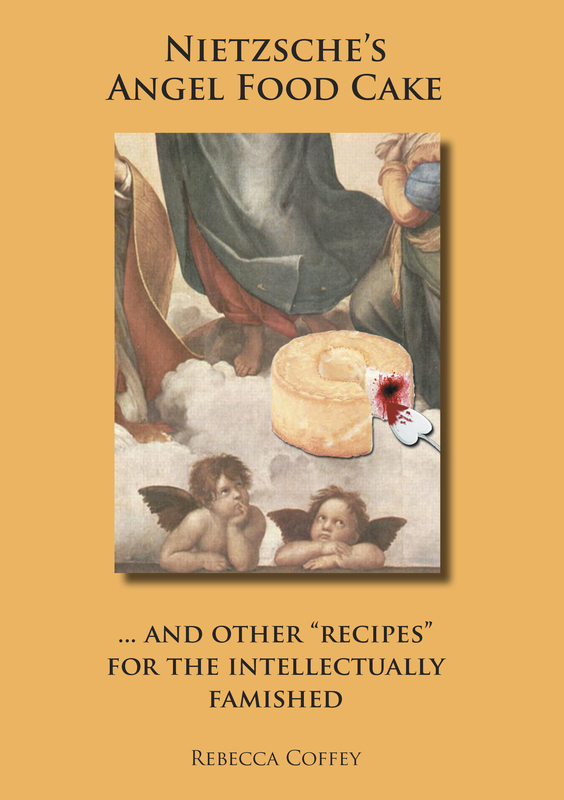 Literary humor for those who enjoy smashing idols fondly, NIETZSCHE’S ANGEL FOOD CAKE: And Other “Recipes” for the Intellectually Famished allows 22 cultural monoliths to share “their” succulent recipes. For those who like cookery to insinuate the hard questions, it offers a funny, surprisingly informative, and entirely whirlwind tour of civilization. Not really a cookbook, it’s for lovers of literature, history, art, music, and philosophy, for foodies, and for anyone with a good liberal arts education, no matter how vaguely they remember it. “Hilariously smart, intensely literary, and delicious in every way.” Elissa Bassist, Humor and Women’s Literature Editor, THE RUMPUS. “Oh my God, I love these! More! More! More! This will appeal to foodies and literary types, and will stretch the boundaries of the ‘cookoir’ genre, for sure.” Erika Penzer Kerekes, Food Columnist, L. A. EXAMINER. “Absolutely fantastic stuff!” Binnie Klein, Radio Host, A MINIATURE WORLD, WPKN-FM. “So brilliantly funny-—and insane, obsessive, sprawling, vivid, satisfying, and lush.” Dee LaDuke, Writer, GIRLFRIENDS and DESIGNING WOMEN. “Full of puns and witty allusions, augmented by the author’s line drawings and other illustrations, this would make a great gift for a bibliophile cook.” Gilion Dumas, THE ROSE CITY READER. “[Coffey] is delightfully witty, especially if you get her literary references. Should you not, don’t feel badly: They’re plentiful and pointed enough that you can hardly miss enjoying seeing Coffey hit her target.” Nell Corley, THE COMMONS. “Like good sausage, or a breakfast I once had in Manilla, Rebecca Coffey’s new book is filled with things I can’t describe and maybe don’t want to know about. I only know it’s wonderful.” Jon Potter, THE BRATTLEBORO REFORMER. [A] knee-slappingly funny sliver of a book … that begs to be read out loud; perfect as a stocking stuffer or for foodies with (or who need) a sense of humor. GOOD STUFF NW. “This is ridiculous.” Friedrich Nietzsche.